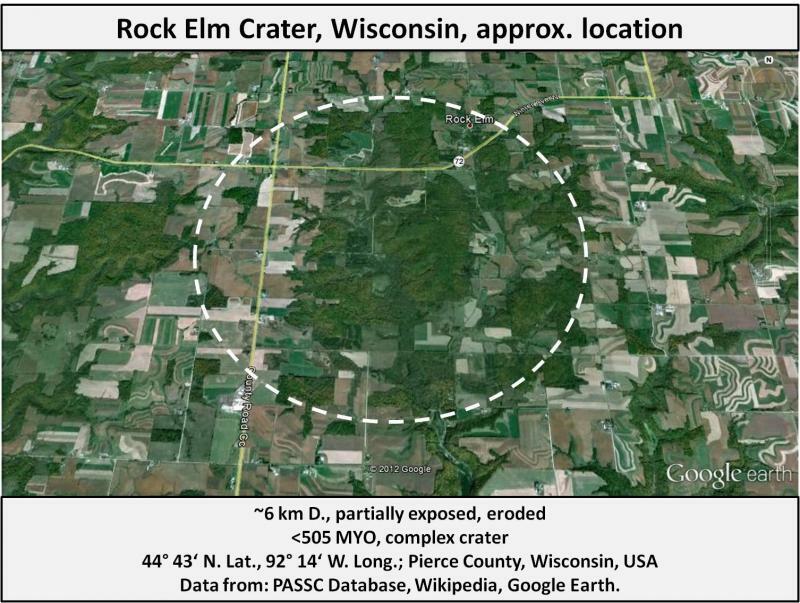 The partially exposed Rock Elm crater, located in Wisconsin, is listed in the Earth Impact Database as a 6 km struture that is preserved in sedimentary rock and dates from the Ordivician period or more recent. According to an article in the March 2004 issue of Geotimes, the structure was first recorded as a disturbance during geologic mapping work in 1942. Bevan M. French, William S. Cordua and J.B. Plescia, The Rock Elm meteorite impact structure, Wisconsin: Geology and shock-metamorphic effects in quartz Geological Society of America Bulletin, January/February, 2004, v. 116, no. 1-2, p. 200-218. Taken individually, the lines of evidence for an impact origin for the Rock Elm structure are somewhat ambiguous. Considered together, however, the morphological and petrologic evidence is compelling. This is summarized in the above article. Notably, no clear PDFs or shatter cones have been recovered at this site (so far as I have been able to find in publications). multiple orientations of PFs with feather features and apparent incipient planar deformation features in quartz grains. Other significant evidence: breccia, feather features on PFs in quartz, planar fractures (in 1 to 4 orientations, Cavosie et al., 2013), characteristic structural morphology (Cordua, 1987). Cordua, W. S. (1987) "The Rock Elm Disturbance, Pierce County, Wisconsin" (field trip guide), in Field Trip Guidebook for the Upper Mississippi Valley Minnesota, Iowa, and Wisconsin﻿, Balaban, N. H. (editor), Minnesota Geological Survey Guidebook Series #15, p. 123-152. Cordua, W. S. (2008) The Rock Elm Impact Structure: Recent Findings and Relevance to the Local Non-Geologic Community (abstract). Abstracts presented at the 33rd International Geological Congress. Cordua, W.S., Evans, T.J. (2007) Geology of the Rock Elm Complex, Pierce County, Wisconsin (map, 1:12,000 scale). Wisconsin Geological and Natural History Survey Open-File Report 2007-02. French, B. M. and Cordua, W. S. (1999) Intense fracturing of quartz at the Rock Elm (Wisconsin) "cryptoexplosion" structure: evidence for meteorite impact (abstract #1123), Abstracts of the 30th Annual Lunar and Planetary Science Conference. Ladd, J., (1985) Geologic map of the Rock Elm area. Tucson, unpublished map made for the Minerals Division of the Superior Oil Company, 2 sheets. referenced in Cordua, 1987, no link found. Plescia, J. B. (2002) Gravity Survey of the Rock Elm, Wisconsin Structure (abstract #1573). Abstracts of the 33rd Lunar and Planetary Science Conference. Roig, C. I. and Cavosie, A. J., (2013) A search for detrital shocked zircons from the Rock Elm impact structure in Wisconsin, USA (abstract). Abstracts of the Southeastern Section 62nd Annual Meeting of the Geological Society of America, Abstracts with Programs, volume 45, number 2, p.61. Roig, C. I., Cavosie, A. J., McDougal, D. J., Cordua, W. S., and Mattson, C. (2013) Detrital shocked quartz in modern sediments eroded from the Rock Elm impact structure, Wisconsin, USA (abstract #2685). Abstracts of the 44th Lunar and Planetary Science Conference. Rossman, N. R. and Anderson, J. L. B. (2008) The Rock Elm Impact Structure: Morphometry of the Southern Fault Block from Seismic Refraction Surveys (abstract #1112). Abstracts of the 39th Lunar and Planetary Science Conference. Ruenger, C. E. (1986) An aeromagnetic study of the Rock Elm Structure, Pierce County, Wisconsin. University of Wisconsin-Oshkosh. Ruenger, C. (1986) An aeromagnetic study of the Rock Elm structure, Pierce County, Wisconsin (abstract), Institute on Lake Superior Geology, 32nd Annual Meeting, Wisconsin Rapids, Wisconsin, Proceedings and Abstracts, p. 70. Viridis, M. and Cavosie, A. J. (2015) The origin of detrital shocked quartz grains from the central uplift of the Rock Elm impact structure, Wisconsin, USA (abstract). Abstracts of the 2015 GSA Annual Meeting, Geological Society of America Abstracts with Programs. Vol. 47, No. 7, p.436.